The Empire State Building is open daily from 8 am to 2 am. The latest entrance is 1:15am. To avoid the largest crowds, visits at the early (before 10.00) or in the late afternoon (after 16.00. Visit at sunset for the most romantic views. We are comparing Empire State Building Ticket Skip-the-Line(VIP PASS Optional) Prices from leading ticket suppliers and Try to find you Cheap tickets prices on the market. The ticket to the Empire State Building, , includes to the highlights of this iconic New York attraction. Visitors enjoy spectacular panoramic views of the city of New York from the observation platform on the 86th floor, which is 320 meters high. Also, visit two interesting exhibits and make use of the downloadable multimedia guide. The Observation Deck offers incredible panoramic views of New York. Gazing out from the Observation Deck of the Empire Estate Buildig you will be able to see New Yorks’s beloved Central Park, the Brooklyn Bridge, Times Square, the Statue of Liberty, the River Hudson and more. The Art Deco Lobby displays beautiful murals. "Dare to Dream" exhibit displays the history of the building. "Sustainability" exhibit introduces sustainability efforts that promote reduction of energy usage. A visit to the Empire State Building is a must for anyone visiting Big Apple. The Empire State Building is suitable for all ages and practical for visitors with walking difficulties. Your Experience With Empire State Building Ticket Skip-the-Line(VIP PASS Optional)? With this ticket, you will enjoy spectacular views of New York and explore the Empire State Building's premises. Before proceeding to the elevator which will take you to the observation platform, take a moment to examine the Art Deco lobby. Take a look at "Dare to Dream" and "Sustainability" exhibits. As you get around, make use of the downloadable multimedia exhibits with images, maps, quizzes and other interesting content. From the Observation Deck, take great photos of Central Park, the Statue of Liberty, Times Square and other points of interest. What Empire State Building Ticket Skip-the-Line(VIP PASS Optional) Includes? The basic ticket: allows you to skip the lines for ticket purchase. Access the Observation Deck on the 86th floor and use of the binoculars. Access to the "Dare to Dream" and "Sustainability" exhibits. Free Wi-Fi throughout the Empire State Building. The 86th level of the Empire State Building is the highest observation deck available in New York so this is undoubtedly the best view that you will find in the city. A visit to the Empire State Building is best around sunset when city lights start to glow. 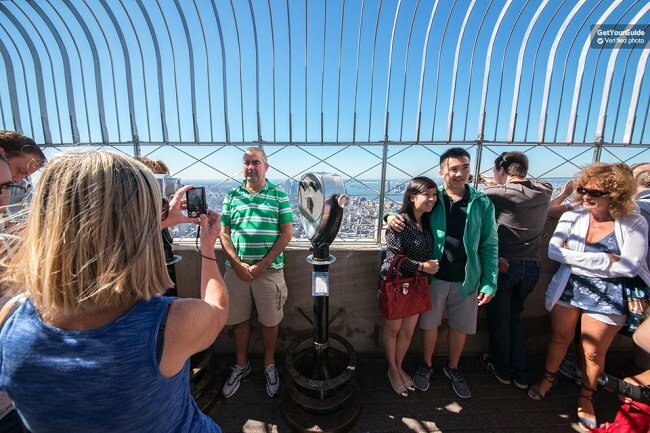 Travelers Reviews about Empire State Building Ticket Skip-the-Line(VIP PASS Optional)? This fast track entrance ticket has a fantastic 4.6 out of 5-star rating on Get Your Guide. People who have visited the Empire State Building describe the views of the city as amazing. They also agree that pre-booking the entrance tickets is worthwhile. The ESB, New York, is wheelchair accessible. Printed and electronic vouchers are both accepted at the entrance of the Empire State Building. Tickets ma not be refundable, this will depend on the individual policy of you ticket provider. Peak times are usually between 11am and 2pm, and around the sunset. A visit to the Empire State Building is free for children under the age of 6. Address: 350 Fifth Avenue, New York.